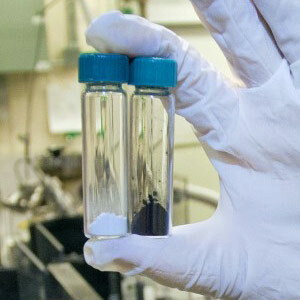 Scientists have developed black titanium dioxide nanoparticles that are able to absorb infrared as well as visible and ultraviolet light, improving the efficiency with which black titanium dioxide can use sunlight to split water molecules for the production of hydrogen. “We have demonstrated that black titanium dioxide nanoparticles are capable of generating hydrogen through solar-driven photocatalytic reactions with a record-high efficiency,” Mao said in a talk at the American Chemical Society (ACS)’s national meeting in New Orleans. The promise of hydrogen in batteries or fuels is a clean and renewable source of energy that does not exacerbate global climate change. The challenge is cost-effectively mass-producing it. Despite being the most abundant element in the universe, pure hydrogen is scarce on Earth because hydrogen combines with just about any other type of atom. Using solar energy to split the water molecule into hydrogen and oxygen is the ideal way to produce pure hydrogen. This, however, requires an efficient photocatalyst that water won’t corrode. Titanium dioxide can stand up to water but until the work of Mao and his group was only able to absorb ultraviolet light, which accounts for barely ten percent of the energy in sunlight. In his ACS talk, titled “Disorder Engineering: Turning Titanium Dioxide Nanoparticles Black,” Mao described how he developed the concept of “disorder engineering,” and how the introduction of hydrogenated disorders creates mid-band gap energy states above the valence band maximum to enhance hydrogen mobility. His studies have not only yielded a promising new photocatalyst for generating hydrogen, but have also helped dispel some widely held scientific beliefs. 1 Comment on "Black Titanium Dioxide Nanoparticles Could Play Key Role in Clean Energy Photocatalysis"
Does this material have the structure of anatase or rutile?